This salad is a bright, chaotic and wonderful party. It's a bit like the Mardi Gras is going on in your mouth, in all the best possible ways. The bright pink pomegranate seeds have formed an ostentatious conga line, the pickled cauliflower and beetroot are dancing a zingy salsa on the tip of your tongue, and the sweet, caramel-y muscat grapes are making sultry eyes at you from some dark corner, while quinoa confetti is thrown over the entire glorious display. I've never been to the Mardi Gras, a fact that makes me rather sad. But life is long and I'm currently not in possession of a pink feather boa or platform heels that would do the event justice, so while I wait (and acquire the necessary wardrobe) I'll keep eating this salad and humming In The Navy softly to myself. Put the quinoa and 1 1/2 cups of water in a saucepan. Add the stock cube and garlic. Bring to the boil then reduce the heat, put the lid on the pot, and let it simmer for about 15 minutes or until all the water has been absorbed. Set aside. While the cauliflower florets and the turnip are roasting, place the finely sliced cauliflower and beetroot slivers in a bowl. Pour over the vinegar. Let sit for 10-15 minutes for the vegetables to pickle, then drain off the vinegar and set aside. Once your turnip and cauliflower florets have roasted, put them in a big salad bowl. 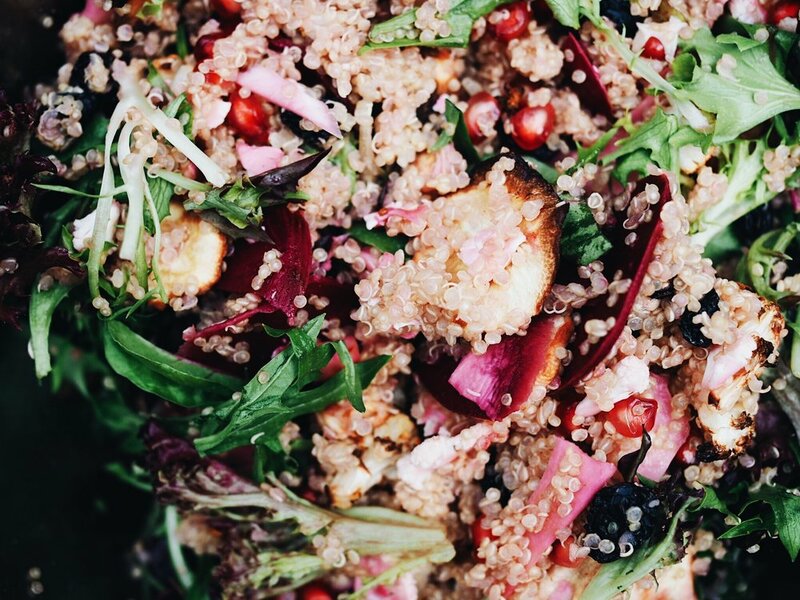 Add the quinoa, pickled cauliflower and beetroot, muscat grapes, pomegranate seeds and mixed salad leaves. Toss gently to combine, then serve.